The Class of 1962 has unseated the Class of 1966 for the top spot in the RMC Foundation Cumulative Class Giving totals for 2018. In just under a year the class has donated over $2.1 million dollars bringing their total cumulative lifetime gifts to the Foundation to over $3.1 million dollars! Last week an anonymous donor from the Class provided a very generous donation of $430,000, of which $25,000 will support the Expedition Club trip to Kilimanjaro in December 2019. With the addition of this gift to the Kilimanjaro Campaign we are now only $12,000 away from our $45,000 goal for this trip! The remaining $405,000 will support the future needs of the Recreation Clubs, allowing more teams and Officer Cadets to compete at the National/International level and to help them to develop the full skill set required to become the next future leaders of Canada. With the latest gift of $430,000 from the anonymous donor, and the $1.65 million gift from 5586 Ian and Rosemary Mottershead to support the annual Battlefield Tour, the Class of 1962 has catapulted themselves to the highest amount of total donations to the RMC Foundation ever. Thank you to the anonymous donor for their continued support of the Royal Military Colleges. Do you think your class has what it takes to take the top spot? Wondering where your class ranks in our Cumulative Class Giving Totals? 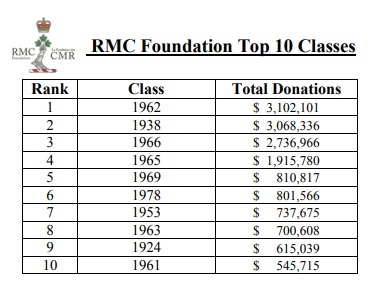 Check out our Top 10 below and contact the RMC Foundation to find out how your class can help.